The Slovak landscape is noted primarily for its mountainous nature, with the Carpathian Mountains extending across most of the northern half of the country. Amongst these mountain ranges are the high peaks of the Tatra mountains. To the north, close to the Polish border, are the High Tatras which are a popular skiing destination and home to many scenic lakes and valleys as well as the highest point in Slovakia, the Gerlachovsky stit at 2,655m (8,711ft). 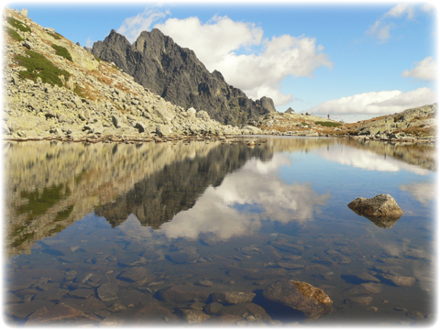 The Slovakian mountains offer challenging hiking and spectacular alpine scenery. In the High Tatras, on the Polish border, snow stays all summer atop jagged granite peaks, waterfalls tumble from stark rock walls, and jewel like tarns sparkle in wide, green glacial valleys. And in the Mala Fatra Mountains, deep narrow gorges and ridgetop trails offer great hiking, while a rich alpine flora is found along its forested paths and richly green meadows. In the Tatras National Park there are many short walks and longer hikes on offer, including: From Strbske Pleso (Red trail), a gently rising course to the tarn Jamske pleso (1 hour, variation of 120 m in elevation); Blue trail, around the mountain lake, then Yellow trail to the FIS sports area (1 hour); From Tatranska Lomnica, Green trail to cableway station start, then Blue trail to meadows at the tree line (1 hour, variation of 656ft); Yellow trail from the cableway to meadows near Matliare, then back via the road Cesta Slobody (1-1/2 hours, variation of 164ft). There is incredible cycling and scenery in just about every region of this mountainous country. Ride countless miles of forested trails, winding mountain roads or challenging single-track trails in some of the country's most spectacular outdoors. The Tatras National Park offers many cycling tracks. There are more than a hundred mountain lakes (tarns) in the park. VeÄ¾ke Hincovo pleso is the largest and deepest. The area around the settlement of Strbske Pleso is a border between two drainage basins. To the east of this border, streams form the Poprad River, which belongs to the Baltic Sea drainage basin. To the west streams are tributaries of the Vah, which belongs to the Black Sea drainage basin. The most popular waterfalls include Studenovodske vodopady, KmeÅ¥ov vodopad, Vajanskeho vodopad, Rohacsky vodopad, and Vodopad Skok. About 300 caves are situated in the park but only one is open to public - Belianska Cave, near the village of Lendak. The longest cave system discovered so far is the cave of Javorinka.